Oh my, not real thrilled with this one. Can't put my finger on it, just not up to par for some reason. It will be going off in the mail tomorrow to a friend who had a little bit of surgery today. The inside says, " Wishing you a Speedy recovery." 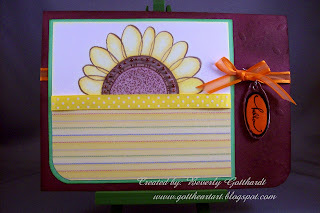 Supplies: 5" X 7" Bravo Burgandy, Papers: Stampin Up-Whisper White, Green Galore, Bravo Burgandy, orange unknown, Debbie Mumm Baby Boy Paper Pack, Stamp: Stampendous-Sunny Flowers, Ink: Ranger Archival Ink-Coffee, CTMH-Z2152 Sunny Yellow, Z2113 Clover Meadow, Stampin Up-Bravo Burgandy, Copic Markers, Stampin Up-Sizzix texture plate-Eyelet, Tim Holtz Fragments, Recollections-dot stickers colored with sharpie marker, ribbon-Michael's, EK Success Lg. Corner Rounder, tiny silver cord. Love that flower tucked behind the DSP!!! 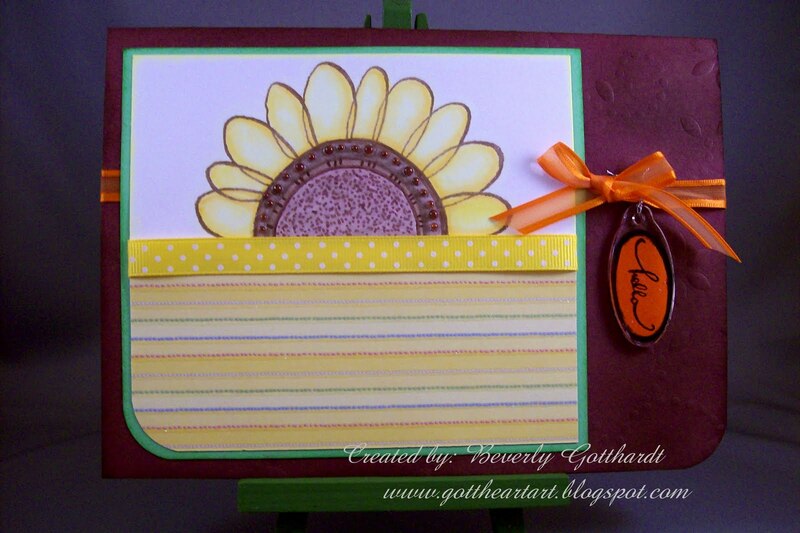 Great job using our sketch and thanks for playing along with us too!! Cute! Looks like the sun peeking up...should definitely cheer your friend! Thanks for playing along this week. What a great idea you have here! I really love the sun peeking out from behind your horizon. Great Job! love your flower =D wil def cheer your friend! Oh no Beverly...it's so cute...the colours are great...and I love how you have the flower peeking over the top...great job...TFS. I love the little flower like that. It does look like the sun rising. Great card!! !